What pathways lead to a sustainable, resilient world in 2050? 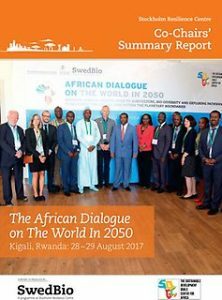 The co-chairs summary report presents a synthesis of the discussions that took place during the African Dialogue on The World In 2050. The Dialogue was co-chaired by Belay Begashaw from SDG Center for Africa and Johan Rockström from Stockholm Resilience Centre, and was held in Kigali, Rwanda, August 28-29 2017. The Dialogue provided a platform to discuss and exchange views on the place of African agriculture and biodiversity and the importance of social-ecological resilience in future development. The summary report includes 10 main messages from the two co-chairs. The full dialogue workshop report can be found here.